I almost didn't read A Hundred Horses by Sarah Lean. For a glimpse into my decision making process when it comes to choosing a book for review, scroll down. But first, A Hundred Horses. When we first meet narrator, eleven-year-old Nell Green, she is at an after school drama program and in trouble for trying to repair a string of lights on her own. Things go from bad to worse for Nell when her mother tells her that she'll be spending the two weeks of her Spring vacation in the country with her Aunt Liv and her little cousins she has never met. Sad and lonely, Nell feels like she has no say over her over scheduled life. Maybe that's why, when she discovers the mechanical carousel that her father built for her shortly before he left, never to be heard from again, in an old brown suitcase, she secrets it with her to Aunt Liv's. But, whatever Nell hoped to hang onto for herself is gone in a flash when a galloping horse and mysterious rider startle her and the rider disappears with the carousel in the suitcase. From that moment on, Sarah Lean weaves a delicate and masterful story of two girls, both seemingly alone in the world, lonely and hoping for the promised magic, real or otherwise, of horses to come through for them. As Nell slowly warms up to an Aunt and cousins she never knew, she begins to open her eyes to life on a farm, life with animals and life with people. She also slowly begins to open her eyes and her heart to Angel Weston, a half-feral, parentless cypher who came into this world by surprise, on a nearby farm in the stable of a horse named Belle. At first, Angel flits in and out of A Hundred Horses, her purpose uncertain. But, like the waxing moon, an image that is repeated often in this layered novel, Angel's history and her motives are slowly revealed and her version of the legend of a hundred horses and the reasons for thefts she commits gradually make sense to Nell, who says near the final chapters of the book, "I realized that I had been lonely for a long time. And I only knew that because I didn't feel like that anymore. Because of Angel. Because we'd found the things about us that weren't different." Another lovely metaphorical image that Lean threads throughout A Hundred Horses is that of an angel, specifically an angel losing and finding her wings. The carousel that Nell's father made by hand that she finds early on in the story is missing the angelic "tin girl who stood on top of the carousel with her arms out and her head back as if she was about to fly." The missing tin girl seems to speak to Nell in a way that leads Nell to uncover parts of herself that she has hidden away. Then, there is the girl named Angel who, Nell's cousin insists, just might be the celestial being she is named for. It is Angel herself who crafts pair of replacement wings made from the feathers of Aunt Rita's geese. And it is wings, wings that just might be real, that are uncovered in a very surprising place at the end of the novel, bringing in a wisp of magic that some readers might even miss. Even without this magical possibility, A Hundred Horses is a movingly transformative story about two children who find the courage to reach out to friends, family and family friends for connection, nurturing and support that they have long gone without. That said, I am an adult and bringing my adult perspective to this story, which I found very moving. 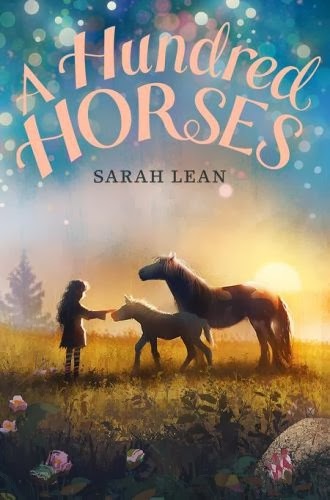 Young readers will take away something else from A Hundred Horses, no doubt, but I do know that subtly, maybe even subconsciously, Lean's story of love, connection and responsibility, whether with a human or a horse, will resonate with them. As Nell says when pondering Angel's version of the legend of the hundred horses, "And I thought about magic and fairy tales. They are not real. It's just that beautiful things make you feel full up inside. As if nothing is missing. And that feels like a miracle." While A Hundred Horses is not exactly a fairy tale, I do believe that readers, young and old, will recognize the beauty in this story and feel "full up inside" as well. Sometimes I am surprised by what guides me to read a book, and sometimes I am surprised by the books that I read. I am very fortunate to receive review copies of books from publishers months in advance of the release date for a book. I can't read and review everything I am sent to my personal standards, so I make "yes," "no," and "maybe" stacks. A Hundred Horses by Sarah Lean made it into my "maybe" stack when I received it a few months back and was about to shift into the "no" stack when I read Jillian Dunham's review of A Hundred Horses in the New York Times Book Review on January 10. As is sometimes the case with the New York Times Book Review, a review, good or bad, doesn't always capture the essence of a book, which turned out to be the case with Dunham's positive review. Yet, there was something in her brief description of the novel that made me pause and reconsider and I'm so glad I did. Winner of the 2013 Schneider Family Award, established in 2004 to honor an author or illustrator for a book that embodies an artistic expression of the disability experience for a child and adolescent audiences. A Dog Called Homeless is the story of Cally, a fifth grader who, a year after her mother's death, has stopped speaking. When her family moves to a new apartment, Cally meets 11-year-old Sam who is deaf and blind. Through her friendship with Sam and the mysterious appearance of a dog, Cally finds her voice.